We’ve all got that staple little black dress in our wardrobe and if you haven’t, you need to get one! Whether it’s the work Christmas party of a festive family celebration, an LBD is a wonderful choice for your Christmas ensemble. Chances are, you’re going to be heading to a number of different parties so find out how you can pull off one little black dress in three fabulous ways. If you’re a fashionista, listen up! Take inspiration from The Great Gatsby era and opt for chic black and gold accessories. This is a timeless look that works beautifully with a little black dress. Plus, the gold accents add a festive touch to your outfit. Glitzy Secrets have a wonderful collection of Gatsby-inspired jewellery that are a must-have for any Christmas party ensemble. Glitzy Secrets’ Art Deco collection features The Gatsby Heiress Clip-On Earrings which looks dazzling alongside a chic up-do, while the Gatsby Drama Cocktail Ring is all you need to make the ultimate fashion statement. Wrap up warm with a glamorous gold or black sequin bomber jacket. Team with a pair of glittering gold shoes and a cute clutch bag for an enviable style. Channel your inner-magpie with classic sparkling crystal jewellery. Christmas just isn’t Christmas without a sprinkling of sparkle, and Glitzy Secrets have a stunning collection that’s perfect for your LBD. Compliment a glamorous ponytail hairstyle with the Starlet of Elegance Earrings – the statement chandelier design will look simply exquisite. Give your LBD a show-stopping look and opt for a statement necklace – a beautiful choice for a Christmas party! Accessorise with a pretty pair of silver heels and a silver sequin clutch bag for a gorgeous finishing touch. 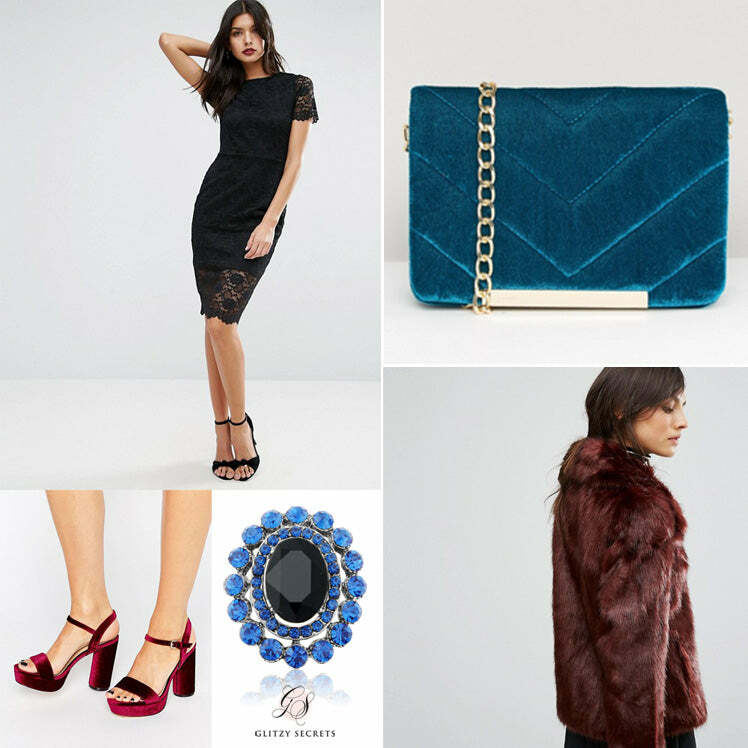 What could be more luxurious than accessorising your LBD with plush jewel tones? Add a pop of colour to your outfit with a pair of garnet red heels and velvet clutch bag. Inject some drama into your with Glitzy Secrets’ The Blues Cocktail Ring – the deep ocean blues are all you need to turn heads at your Christmas party! Finish your look off with a lavish burgundy lipstick and a cranberry faux fur jacket. Striking, vibrant and totally decadent. It’s effortlessly easy to pull off three different looks with that essential little black dress in your wardrobe. The best news? They’re all equally fabulous!